Lessons for Micro Beginners Modern Machine Shop 71 The smallest end mill that Minnesota Micro Molding, Machining & MFG (M5) has used to date is only 0.002 inch in diameter. It was used to machine 0.003-inch-wide slots in this part, a fixture to hold a laser-cut component. The pockets (the bottoms of which are the circular shapes visible here) are themselves only 0.014 inch across. 0.014 Dia Pocket 0.003 Wide Slot which the machinist-as-craftsperson develops an intuitive understanding or "feel" for the relations between all the interacting elements of a project, as well as an abstract understanding through programming and calculations. 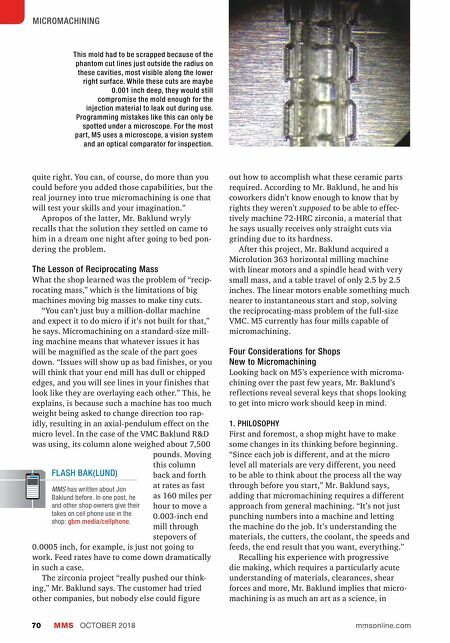 Pivoting to his R&D experience, he advises shops that are looking to get into micromachin- ing to "take it slow" and give those who have the interest and aptitude the latitude to try new things and experiment. "Just take your time, try different things and don't wreck anything. Let's see how we can make this work," he tells his machinists, ref lecting that "The incentive of doing something new, for a machinist, is generally enough incentive to make something work. Machinists desire to build new things all the time." 2. PLANNING As part of shifting toward a holistic approach to the given project, planning becomes very important. Surprises happen, but when the scale is so small, they need to be minimized if at all possible, which means "your project planning is completely different." Mr. Baklund cites workholding as a salient example: "Once you machine a small part, find- ing a place to hang onto for a second operation is incredibly difficult. Generally, these small parts are not just small, square parts; generally they're small parts with lots of edges, lots of angles, radiuses inside and outside." 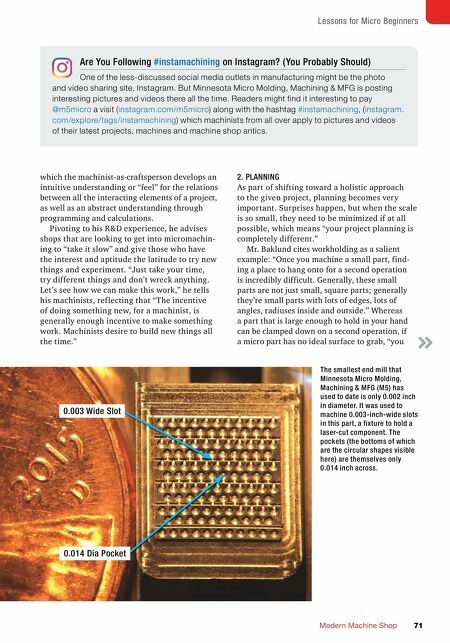 Whereas a part that is large enough to hold in your hand can be clamped down on a second operation, if a micro part has no ideal surface to grab, "you Are You Following #instamachining on Instagram? (You Probably Should) One of the less-discussed social media outlets in manufacturing might be the photo and video sharing site, Instagram. But Minnesota Micro Molding, Machining & MFG is posting interesting pictures and videos there all the time. Readers might find it interesting to pay @m5micro a visit (instagram.com/m5micro) along with the hashtag #instamachining, (instagram. com/explore/tags/instamachining) which machinists from all over apply to pictures and videos of their latest projects, machines and machine shop antics.